Frame your Tassel Topper with your favorite graduation photos in each corner on black acid-free matting. It is framed in our Sierra moulding made with 100% recycled wood and has a dark mahogany finish. Hold four 3.125" x 3.375" photos. Customize this frame with your school colors! Do you have another diploma or document to frame? Church Hill Classics is pleased to have established a partnership with . In an effort to fully support this organization, we refer all sales directly to them. Please support your , by placing your order using one of the methods below. International and accelerated shipping options are also available, and the cost will be calculated in the checkout process. Need a frame matching a different Document size? All of our frames are custom made to order so we can very easily create a frame that fits your specific Document size. Please call our customer service department at 800-477-9005 or email info@diplomaframe.com and provide the Item # of the frame you would like to purchase along with any customizations and the size and orientation of your Document. Love This Frame? View #EarnItFrameIt Customers with Similar Styles and Display Ideas! Our Clear (Standard Glass) and Reflection Control options block 45% of UV light. Our Conservation UV Protection and Conservation UV + Reflection Control offer more protection from fading and deterioration by blocking 99% of UV light. Any option with Reflection Control also provides a non-glare finish on your frame. In order to minimize unwanted glare, this glass features an etched matte-like finish, and therefore does not have the crystal clear look of standard glass. Why does this frame have plexiglass? Due to the large size of this frame, we use professional-grade plexiglass to reduce the possibility of breakage during shipping. Our high-quality plexi features the same level of document protection as our standard clear glass, and we also offer upgraded plexi options for added protection. You are viewing a store that is not assigned to your MyFrames account. If this is in error, please contact Church Hill Classics to have it assigned to your MyFrames account so that you may place wholesale orders. If you would like to special order this product, please contact Church Hill Classics. If you would like to purchase this product at Retail, please log out of your MyFrames account and proceed to add the product to your cart. Any questions? Reach out to our friendly customer service team at info@diplomaframe.com, through our Live Chat service, or you can reach us M-F 8:30 am – 5 pm Eastern at 800-477-9005. Our diploma frames are custom handcrafted to fit your school’s diploma size(s). 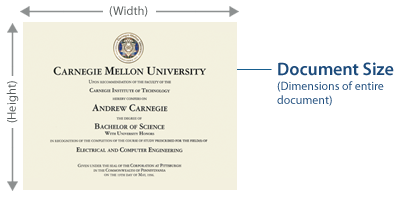 We ask for your graduation year to confirm the correct frame document size. The year of graduation will not appear anywhere on your diploma frame.